One of the large challenges in aquatic weed control is buy-in from fisherman that there is a real difference between a healthy native plant community and a dense monoculture of invasive weeds. While a stand of invasives can provide good fishing habitat initially, it's very nature will soon degrade the fishery. 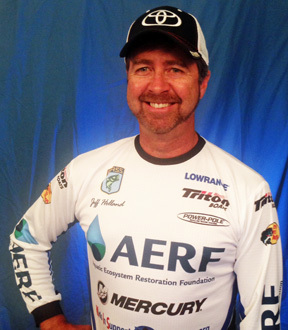 One of AERF's strongest spokesmen on this issue is Jeff Holland, a professional biologist and competive bass fisherman. Jeff has always felt that anglers represent the most passionate, vocal, and organized lake user-groups in the US, and has enjoyed the pleasure of sharing AERF's mission with these recreational enthusiasts over the last four years. Jeff Holland, is a full time biologist who has been competing as a professional bass angler on the Bassmaster Open trail. If your B.A.S.S. Nation club has a proposal for a project that either helps control invasive aquatic plants or helps native vegetation thrive, your club could win the $3,000 AERF-APMS/B.A.S.S. Conservation Aquatic Vegetation Management Grant in 2016. The chapter or club that proposes the most outstanding project will be awarded the grant. The project must be multi-year in scope and on waters accessible to the public. The proposal submission should be a one-page document and must include the components listed here. Submissions will be judged on the description of the need, goals and objectives, a monitoring plan, youth angler involvement, and partnering. 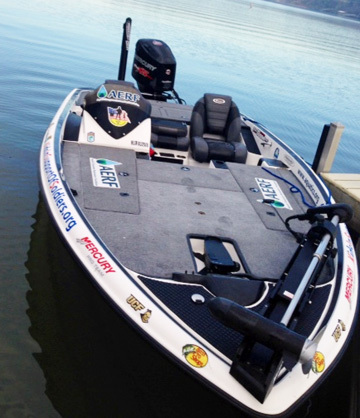 Projects must be submitted to Gilliland at ggilliland@bassmaster.com. Judges will be Gilliland and representatives of the Aquatic Ecosystems Restoration Foundation and the Aquatic Plant Management Society.